Welcome to the sefienation! I know we like to selfie, wefie and groupfie whenever we can right. It is fun and at the same time captured the happy moments together be it yourself, with friends, your love ones or family. By the way when you are apart with your friends do you want to see what your friends are up to now? Do you know you can do it in a single picture collage by using Picpal App? I am sure the next thing you want to know what is so special about this Picpal App and why you should have it on your mobile. 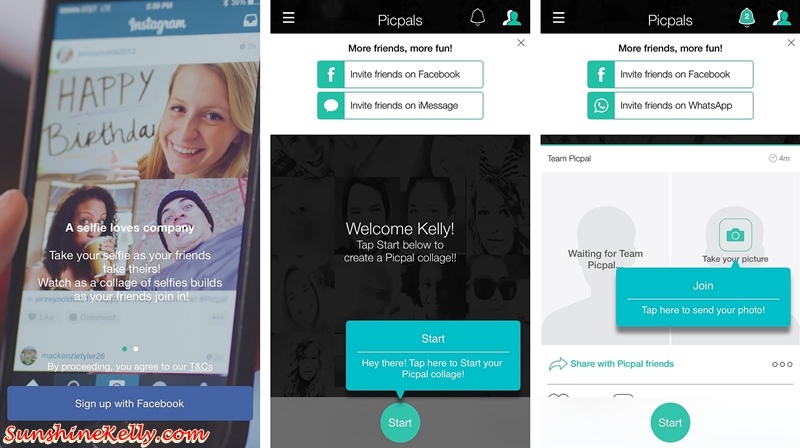 Ok with Picpal, you and your friends or your love ones can be together in a single collage, no matter the distance between you. Sounds cool right, it’s like so close and connected yet so far apart. Let me show you how to use the app and how much fun it can be when you start. Picpal App is available on iOS and also Andriod platform. Its free to download. I was at the park and saw a tree uprooted because there were storms and rain earlier. Gotta take a selfie with that tree and here I uploaded it on my Picpal and then created a collage with one of my friends on Picpal App. Cool! Let’s explore more and see what else can we do more with this app. Alright the app is pretty simple to use and here is the home page. I can find my friends through Facebook or WhatsApp or invite them to join me on Picpal also. Other than that I can personalize my Profile and Account Setting. 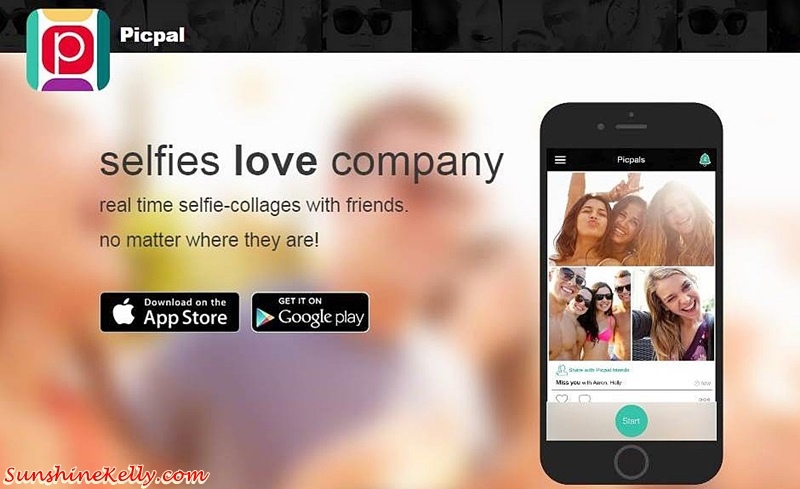 Picpal is a real time selfie collage with friends app no matter where they are. We can invite up to 3 friends, I take my own selfie while my friends take theirs. Watch the real time moments become a Picpal collage with all the selfies appearing in a single frame. Then, share it on Picpal and also other social media platforms such as Instagram, Facebook, Facebook Messenger and iMessage. Another way we can also download the picture collage and keep it as a memory or even print it out as postcard or frame it. Especially when we travel to different countries, we can take selfies with the scenic background and collage with our loved ones or friends. Photos are the best souvenirs and best kept memories. 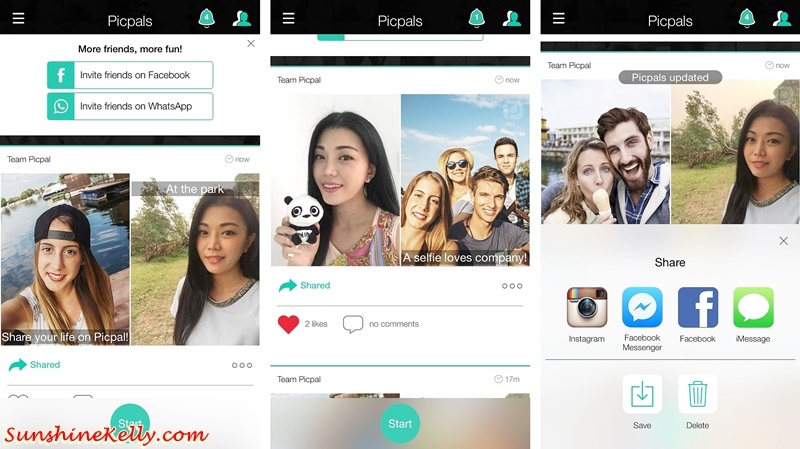 For example I am in Japan and my partner is in the US so both of us are on Picpal and we took the photos with the scenic background and collage it on Picpal in real time. Then shared it, I think its sweet and creates a good memory while we are apart in different countries but we still connect somehow. That is so memorable. You can do this with your friends that study in different countries or different colleges. Let’s share about our campus life, travel moments, parties and much more. Oh ya Halloween is coming, so how about collage our Halloween look and outfit on Picpal with friends. I am sure it’s going to real time fun fun fun. Heart and comment on Picpals to spread the love. 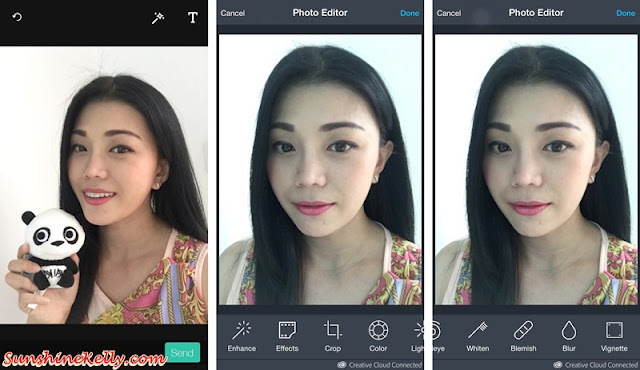 Ok for those who are a bit conscious about how we look on the photos, hey don’t worry in Picpal you can edit your photos, clear the blemishes mark, brighten it or you can apply fun filters, doodles, vignettes and a lot more to your photos. So enjoy it. Overall, I find that this PicPal App is quite fun, easy to use and hassle free. It’s fun when you have more friends and family members on the app. The more the merrier! Eyy, this is a fabulous app. I can imagine my blogger friends and I going to the same event, taking our selfies and making a collage using this app. We don't have to squeeze into a small phone camera frame to take a "group" photo! This is a cool app to use especially when you and your friends are in different places. No need to spend so much time editing too! Apps are made to make things easy in a handyphone from online shopping to weather forecasting, from events plugins to group selfies. All is done an applications. It is really a wonder. Whether it's filtered or not, your skin is amazing! Although it's a cool app, I don't think you need it ! Cool up to keep in touch. Especially since my friends and I are usually in different ends of the world, this will be a good way to keep in touch. Everyone's crazy with selfies but I usually stick to that 1 app that can serve my purpose. Maybe I will try that one day when I'm free! Cool App. Only heard of this one. And I guess this would be viral. I haven't seen this being used by my friends yet. Have yet to share this to them. My nieces and nephews go gaga with selfies. This app is a good one for them to check out. I think this app is a great way to connect with friends even across the distance. It keeps you sharing photos with each other too. Looks interesting but I do not know how often I will be using their international collage capability. My daughter may enjoy this though, will show her. The feature is amazing for a friends that are in other places. I might try this app!